Scroll down to see the top not-for-profit colleges offering human resources degrees online. Advertisement This search widget accesses a list of schools that help sponsor this website by paying a small fee for student inquiries. They are all accredited institutions. Some may be included in our rankings, but that is not related to their participation as an advertiser. In general, evaluating as many schools as possible (whether through this widget or through other sources of information) will help you find the best fit. Tell us what you're looking for and we'll get you started! Benedictine University offers two online options for its Master of Science in Management and Organizational Behavior degree. Students may take one course at a time in a traditional format, or they may sign up for the accelerated cohort model, which allows them to complete the degree in half the time and progress through the program with the same group of students. Courses are offered in six sessions per year, and no thesis is required. Students must complete 64 credits, with 34 credits in core management classes and 30 credits in the concentration and electives. The online Bachelor of Arts in Organizational Leadership is a degree-completion program that includes courses in labor and management relations, organizational dynamics, and operations management. Bethel University has an online program for adult undergraduates seeking a Bachelor of Science in Business Management with a concentration in Human Resources Management. The program requires students to complete 49 credits and can be completed in as little as 22 months. Required courses include financial accounting, business law, compensation, benefits, employment law, and talent management for the new world of work. Students must also complete a capstone project that involves experiential learning and helping a client to solve an organizational need. Applicants to this program must already have 60 credits; those who do not meet that requirement may be able to take courses through Bethel's associate degree programs. Students can start the program in the spring or fall. Both undergraduate and graduate students can earn a degree in human resources in a fully online format through Brandman University. Graduate students can earn an MBA in Human Resources or a Master of Science in Human Resources. The MBA requires up to 48 credits, depending upon waivers, with 12 credits dedicated to the human resources emphasis. The M.S. degree requires 36 credits and covers topics such as conflict and negotiations, recruitment and selection, training, compensation, benefits, and legal issues in human resources. Both master's programs require a capstone project. The Bachelor of Business Administration in Human Resources requires students to earn 21 credits in human resources courses and 51 credits in core business classes. Sessions are eight weeks long. Colorado Christian University offers online programs in human resource management that are designed for adult students. Options include an Associate of Science in Human Resource Management, a Bachelor of Science in Human Resource Management, and a 12-credit Human Resource Management Certificate. Students in the bachelor's program take courses covering training and development, workforce planning, labor and employment law, performance management, and compensation and benefits. CCU allows students to apply up to 31 credits from prior learning and life experiences. The associate degree focuses on topics such as organizational behavior, human resource administration, leadership, and business law. The 60-credit program includes 15 credits in the major. CCU courses are offered in five-week blocks and include online forums and group discussions. Colorado State University's online Global Campus offers entirely online programs that allow students to earn a Master of Science in Human Resource Management or to complete a Bachelor of Science in Human Resource Management. Undergrads can transfer as many as 90 credits from other accredited institutions. The B.S. degree requires 120 credits overall, and the HRM curriculum includes 10 classes, including a capstone. The 36-credit master's program includes 24 credits in core classes. Both programs are delivered in a 100 percent online format with asynchronous classes. CSU-Global's classes are offered in an accelerated eight-week format, and a new term starts each month. All online courses are offered every term for ease of scheduling. The college does not charge out-of-state tuition fees. Online students can earn a bachelor's or master's degree in human resource management through Columbia College. The master's program offered online is an MBA with an emphasis in Human Resource Management. The 36-credit program includes 27 credits in foundational and core business courses and nine credits in the HRM emphasis, including a required course in employment law and electives such as organization training and development, compensation and benefits, or recruitment and selection. Undergrads can earn a Bachelor of Arts or Bachelor of Science in Business Administration with a major in human resource management. Undergrads take 51 credits in core business classes and 18 to 21 credits in the major. Columbia College also offers an online, 18-credit Human Resources Management Certificate. Concordia University St. Paul offers online programs leading to undergraduate and graduate degrees in human resource management. The Bachelor of Arts in Human Resource Management is a fully online, 40-credit degree completion program for adult learners. Classes are delivered in a seven-week format and include topics such as legal issues in human resources, staffing, compensation and benefits, and organizational development. Students must complete 128 credits to earn the degree. The Master of Arts in Human Resource Management is a 36-credit program offered completely online with no need to attend meetings on campus. The curriculum aligns with the Society for Human Resource Management's standards. Courses cover topics such as human resources leadership, recruitment and selection, and an action research project. Davenport University has two online programs in human resource management. The Bachelor of Business Administration in Human Resource Management is a 120-credit program that prepares students for human resource careers. The program includes 39 credits in general education foundation classes, 32 credits in foundational business classes, and classes in the major. Students have the option to work an internship in a human resource setting or to do a field-based project where a team of students assists a client such as a non-profit. Either class fulfills the requirement for experiential learning. Davenport also offers an online post-baccalaureate Human Resource Management Certificate. The certificate is for students with a degree in business who want to learn the fundamentals of HRM. Eastern Michigan University delivers coursework for a Graduate Certificate in Human Resource Management in a fully online format. The program is open to students who have a bachelor's degree from an accredited college and a GPA of at least 2.7. The 15-credit program includes two required courses and three electives. Required courses cover organizational theory and behavior and strategic human resource management. Eligible electives cover topics such as employment law, staffing, compensation management, benefits administration, working in a unionized setting, and human resource technology. Students may be able to transfer three graduate credits to this certificate program. Franklin University has fully online programs leading to undergraduate and graduate degrees in human resource management. The university has two options for the Bachelor of Science in Human Resource Management. Students who do not have an undergraduate degree can complete a 124-credit program that requires 50 credits in general education classes, 28 credits in the business core, and 28 credits in the major. Students who have already earned a bachelor's degree can earn a subsequent Bachelor of Science in Human Resource Management by competing 28 credits in the business core and 28 credits in the major. The Master of Science in Human Resource Management is a 10-course program that students can complete in as little as 16 months. Geneva College offers an online program leading to a Bachelor of Professional Studies in Human Resources that students can complete in as little as 18 months. The program, offered through Geneva's Adult Degree Programs division, focuses on fundamentals of human resource management. Required courses include topics such as organizational analysis, business communication, personnel management, employee and labor relations, training and development, and career development. Courses are offered in two terms each semester, and students can access classwork at the time they choose. Full-time and part-time students are welcome to enter the program. The Adult Degree Program is for students who have been out of high school for at least five years and have at least 64 transfer credits. Golden Gate University offers a variety of completely online graduate and undergraduate programs for students interested in human resource management (HRM). Options include an MBA with a concentration in HRM, a Master of Science in Human Resource Management, a Bachelor of Arts in Management with a concentration in HRM, a Bachelor of Science in Business with a concentration in HRM, and graduate and undergraduate certificates in Human Resource Management. The M.S.-HRM program is fully aligned with the curriculum outlined by the Society for Human Resource Management and allows students to work an optional internship to gain real-world experience. The Master of Science program requires 33 credits. The MBA program requires 54 credits, including 12 in the concentration area. Indiana State University offers an undergraduate and graduate degree in human resource management through its online offerings. The Master of Science in Human Resource Development requires students to complete 33 to 36 credits and allows a choice of a thesis or a major project. The completely online program also includes electives so students can develop an area of specialization. Students are also required to complete a professional internship. The Bachelor of Science in Human Resource Development includes 14 required courses in the major and three electives chosen from departmental offerings. All required courses for the major are offered online, and students may be able to complete their foundational studies online or at a local college. National University offers a completely online program leading to a Master of Arts in Human Resource Management. The program aligns with the curriculum guidelines set by the Society for Human Resource Management and uses case studies and experiential learning. The program consists of a minimum of 54 quarter units of coursework, with 11 required courses and one elective. Courses cover topics such as legal and ethical issues, workforce planning and development, employee relations, compensation and benefits, and organizational behavior. The capstone course requires a thesis or capstone project. Students have the option of completing a specialization in organizational leadership. National University also offers a four-course online program leading to a Certificate in Human Resource Management. New York University's School of Professional Studies has several online options in human resource management. Undergrads can earn a Bachelor of Science in Leadership and Management Studies with a concentration in Human Resource Management. The fully online program includes 60 credits in required business courses and 16 credits in the concentration. The Master of Science in Human Resource Management and Development allows students to choose a concentration: Human Resource Management; Organizational Effectiveness; Learning, Development, and Executive Coaching; or Global Talent Management. Students take eight core classes and four classes in the concentration and complete a thesis or capstone project. Full-time students can earn the master's in two years. A two-course Graduate Certificate in Human Resources Management is also offered online. Nova Southeastern University has an online option for students who want to earn a Master of Science in Human Resource Management. Students can complete the program in as few as 21 months, and they have the option of starting their studies at five times during the year - January, March, May, August, or October. Courses are delivered in eight-week terms and include real-time electronic classrooms and student discussion forums and bulletin boards. Courses in the 39-credit program cover topics such as managing organizational behavior, career development, managing and measuring human resources, talent management, employee relations, and tools and technology used in the human relations profession. Palm Beach Atlantic University offers an online Bachelor of Science in Organizational Management that allows students to concentrate in Human Resource Management. For the concentration, students take a required course in human resource law and three electives in topics such as adult education and human resource development, balancing work and life, and conflict coaching skills. The organizational management degree requires 121 credits, including 45 credits in general education and 44 credits in the major. Students may enter the program in the fall or spring semester. Palm Beach Atlantic University allows students to earn professional education credits to speed their degree completion. Credit may be awarded for certificates or licenses the student has achieved, and for professional or military training programs. Penn State Online offers a variety of options for degrees in human resource management. The 100 percent online Master of Professional Studies in Human Resources and Employment Relations allows students to choose from seven concentrations: benefits and compensation; labor and collective bargaining, employment and labor law; staffing, training, and development; ethics and leadership; international human resources and employment relations; or labor unions: organization and strategy. Undergrads can choose from a major in Organizational Leadership or in Labor and Employment Relations. For either major, students may choose an online course of study leading to either a Bachelor of Arts or Bachelor of Science, depending upon their career goals and interests. Most courses are delivered in an asynchronous format. Robert Morris University offers a completely online Master of Science in Human Resource Management. RMU's HRM program has a strategic focus and aims to prepare students to be HR managers and key members of the leadership team. Courses cover topics such as compensation management, employee rights, decision sciences for human resource management, and benefits administration. The program is designed for part-time students, and courses are arranged in eight-week sessions. Students can complete the program in two years by taking one course each session, including one course over the summer. Applicants must have a bachelor's degree from an accredited university and a minimum 3.0 GPA. Prerequisites include accounting, statistics, finance, and organizational behavior classes. St. Leo University offers online options for undergraduate and graduate programs in human resource management. The Bachelor of Arts in Human Resource Management prepares students for jobs in human resource positions and also qualifies them to take the Professional in Human Resource certification exam. In addition to completing general education courses and earning 36 credits in business core courses, students must earn 27 credits in human resource core courses. Topics covered include selection and placement, total compensation, personnel law, human resource development, and an internship. Online MBA students can choose a concentration in Human Resource Management. The 36-credit program includes 15 credits in HRM classes. A 21-credit Graduate Certificate in Human Resource Management is also available online. SUNY Empire State's online program allows students to earn a Bachelor of Science or Bachelor of Professional Studies in Business, Management and Economics with a concentration in human resource management or in labor relations. Students design an individualized program of study in consultation with a faculty mentor. The School for Graduate Studies also offers an online Graduate Certificate in Human Resource Management that aligns with the professional competencies recommended by the Society for Human Resource Management. Students may begin work on the certificate program in the fall, spring, or summer semester. Required courses include high performance management, managing human capital, performance management and total rewards systems, and strategic human resource management. The credits may be transferred to the MBA program. Thomas Edison State University has online programs leading to a graduate or undergraduate degree in human resource management. The Master of Science in Human Resources Management requires student to complete 27 credits in core courses such as strategic recruiting and retention, legal and ethical issues, and lifestyle benefits and compensation. Students also complete two electives and a capstone project. Students may be eligible for prior learning credit or to transfer up to 12 credits. The Bachelor of Science in Business Administration in Human Resources Management/Organizational Management focuses on topics such as industrial relations, compensation, employee selection and training, and organizational behavior. Students must complete 120 credits including a capstone requirement that incorporates learning from across the degree program. Students interested in human resources management can choose from undergraduate and graduate programs offered online through the University of Maryland's University College. The Bachelor of Science in Human Resource Management combines theories with practical skills and applications. Students take at least 12 classes in the HRM major. The Online Master of Science in Management allows students to specialize in Human Resource Management. The program requires students to take several core courses and seven courses in the specialization. Master's students must also complete a capstone course. UMUC accepts a variety of transfer credits and grants academic credit for life experiences including military education and experience, workplace learning, and credit by exam. Online programs have multiple start dates per year. The University of the Incarnate Word offers an online MBA program with a specialization in Human Resource Management. The program requires students to complete 30 credits and can be completed in 10 months. Students must meet prerequisites, including courses in accounting, information systems, economics, quantitative analysis and statistics, finance, global environment, marketing, business law, and management. The classes are offered in an asynchronous format so students can view class materials at a time they choose. The courses are delivered in accelerated, eight-week terms, with six terms per year. UIW Online also offers a Bachelor of Arts in Human Resources that can be completed 100 percent online. The program is for adult learners with at least three years of work experience. Upper Iowa University has several online options for students interested in human resource management. Undergraduates can major in human resource management, and UIU's curriculum meets the standards set by the Society of Human Resource Management. Undergrads take classes in topics such as employee selection and evaluation, labor relations and negotiation, benefits management, and strategic management. Students in the online MBA program can choose human resources management as their area of emphasis. UIU requires MBA students to complete 36 credits, and the college delivers courses in six eight-week terms each year. All MBA students must complete a capstone experience that demonstrates their competency in the area of emphasis. UIU also has an online, five-course Post Graduate Certificate in Human Resource Management. Students interested in human resources can choose from two online graduate degree programs at Webster University. The Master of Arts in Human Resources Management prepares human resources professionals to work in business, industry, government and non-profit organizations. The Master of Arts in Human Resources Development is designed for students who work in corporate offices, training firms, or human resources development consulting firms. Students must complete 37 credit hours to earn either master's degree. Classes are delivered in an asynchronous format, so students do not have to log in at a specific time, although they must meet weekly deadlines. Classes are offered in eight-week, nine-week, and 16-week formats, with no requirement for a student to spend time on campus. Students with some college credit or experience in human resources or in business can earn an online Bachelor of Science in Human Resource Management from Western Governors University. The program covers all six categories of learning in the Human Resources Certification Institute's HR Body of Knowledge, and the curriculum aligns with the Professional in Human Resources Certification Exam. Required courses include topics such as recruitment and selection, employment law, and compensation and benefits. To earn the degree, students must earn 120 credits and complete a professional portfolio and capstone project. WGU uses a competency model where students can earn as many credits as they want (they must earn at least 12) every six months for a flat tuition fee. In the online realm, Wilmington University offers a Bachelor of Science in Human Resource Management, a Master of Science in Management with a concentration in Human Resource Management, and an MBA with a concentration in Human Resource Management. To earn the bachelor's degree, students complete general education requirements, 33 credits in core business classes, 33 credits in management core classes, and 12 credits in related business or HRM electives. Students may work a co-op experience for academic credit. For the MS degree, students must complete 18 credits in core business management classes, 12 credits in HRM courses, and six credits in electives. Two independent study projects are included in the curriculum. Wilmington may award up to six graduate credits for a Senior Professional HR Manager certification. And for the MBA, students must complete a 21-credit hour Business Administration core and 18 credits in the HR concentration, including courses in international HR, compensation & benefits, and training & development. Online programs in human resources are a blessing for HR managers. They’re extremely accommodating to working professionals and stuffed with career-focused coursework. If you like the idea of distance learning, but aren’t sure about the pros & cons, read on. We have tips on choosing an online degree, transferring credits, gaining real-world experience, earning professional certifications (e.g. PHR), and more. We also profile the top online schools in our rankings for both quality and price. Want a little more background & info on the HR profession? 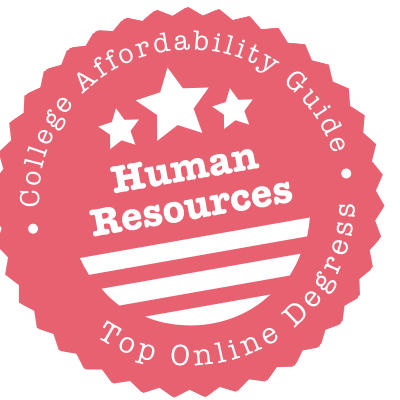 Have a squizz at our guide to Affordable Human Resources Degrees. In addition to discussing job opportunities for degree holders, we take a good hard look at the certification debate between HRCI and SHRM. Can You Find One? They are uncommon, but they do exist. If you do some searching, you may also find relevant programs that fall under degree titles such as “Management” or “Business Administration.” For example, Colorado Technical University’s Online AS in Management is an HR degree that encompasses areas such as management, administration, business law & analysis, finance, and marketing. Check the curriculum if you have any doubts. Should You Opt for an AAS, AA or AS? Traditionally, an AAS is designed to train you for a job (e.g. HR assistant). You’ll notice that Rasmussen College’s 91-credit Online AAS in Human Resources and Organizational Leadership is longer than the usual two-year associate’s degree. Students in AS or AA programs frequently transfer their credits to a bachelor’s program. Will Your Online Credits Transfer Easily to a Bachelor’s Program? Once you’ve graduated, you may want to apply your hard-earned associate credits to an online bachelor’s degree or a program close to home. Check with the university or college you favor to make sure your online credits will be accepted. Some universities have an easy transition process. For instance, students who graduate with Colorado Christian University’s Online AS in Human Resource Management can apply all 60 credits to CCU’s Online BS in Human Resource Management. Should You Choose a BA, BS, BSBA or BBA? Broadly speaking, BS programs tend to have a healthy dose of technical and science subjects; BA programs incorporate courses in liberal arts and languages; and anything with “Business Administration” in the title will lean heavily on business topics. For instance, the University of the Incarnate Word’s Online BA in Human Resources is a mix of business, HR, and a core curriculum (literature & arts, science, second language, philosophy, and religion). But Brandman University’s Online BBA includes 51 mandatory credits in business. Choose the program that suits your goals. What Do You Want to Concentrate On? Shop around when you’re putting together your shortlist. Our rankings include a number of degrees in business and management that offer HR as a concentration or specialization. Other schools put HR in the title and then allow you to concentrate on a specific field. For example, Colorado State University has an Online BS in HR Management with specializations in areas such as accounting, public relations, IT management, etc. What About Labor Relations? If you love this part of the HR landscape, you can start specializing early. For example, students at Pennsylvania State University can choose an Online BA or BS in Organizational Leadership or Labor & Employment Relations. Meanwhile, SUNY Empire State has an Online BS or BPS in Business, Management and Economics with a concentration in HR management or labor relations. What Are the Prerequisites? If it’s a program built for working professionals, there may be some entry requirements that go beyond the usual high school diploma. For instance, the University of the Incarnate Word’s Online BA in Human Resources is designed for adult learners with at least three years of work experience and Geneva College’s Adult Degree Program is for students who have been out of high school for at least five years and have at least 64 transfer credits. Will You Gain Real-World Experience? Strong online programs will find ways to incorporate internships and work experience projects into the curriculum. To take just two examples, students in St. Leo University’s BA in HR Management must complete an internship as part of the required coursework. Meanwhile, undergraduates in Davenport University’s BBA in HR Management can opt for an internship or a field-based project for a client. Look for programs that expose you to experiential learning and valuable career contacts. Is it a Degree Completion Program? These types of programs are common in the online world. It means you must complete an associate’s degree or a certain number of undergraduate credits at a separate institution before you can transfer to the bachelor’s program. At Concordia University St. Paul, for example, the Online BA in HR Management is only 40 credits, but 120 credits in total is required for graduation. Can You Apply Academic & Career Credits? Schools are often very accommodating about credit transfers, especially when it comes to programs for adult learners. At Colorado State University, undergraduates can transfer up to 90 academic credits from other accredited institutions into its Online BS in Human Resource Management. Alternatively, Palm Beach Atlantic University will accept professional education credits for relevant certificates/licenses and professional or military training programs. Explore all your options with the program coordinator. Does the Program Prepare You for Certification Exams? As an HR professional, you’re probably going to be looking at certification from HRCI or SHRM (see our Certification section below). The good news is that many online bachelor’s programs will prepare you for the exams. Prep for PHR certification is common, but students in Colorado State University’s Online BS in HR Management can take advantage of special offers related to the SHRM-CP and SHRM-SCP exams. Programs usually talk about certification options on their website, but it never hurts to ask. What Do You Want to Specialize in? Once you reach the graduate level, there are tons of online master’s programs in HR with fascinating specializations. To take just one example, Pennsylvania State University has an Online MPS in HR and Employment Relations with a whopping seven concentrations (i.e. benefits and compensation; labor and collective bargaining, employment and labor law; staffing, training, and development; ethics and leadership; international human resources and employment relations; labor unions: organization and strategy). You’re sure to find something that suits your career goals. Should You Go for an MBA or MS? An MBA will have business courses at its heart and an MS will focus almost exclusively on HR topics. (Online MAs are not very common at the graduate level). For instance, Brandman University’s Online MBA in Human Resources requires up to 48 credits, with only 12 credits dedicated to the HR emphasis. But its Online MS in Human Resources is a 36-credit program with coursework in areas such as conflict and negotiations, recruitment and selection, training, compensation, benefits, and legal issues. Each degree has its pluses and minuses. Talk to your mentors if you have any doubts about your choice. Are You Interested in HR Management or HR Development? There is a difference. HR managers are concerned with handling the various aspects of a workforce across an organization or company; HR development professionals are involved in nurturing talent & skills, training & retaining employees, and developing a stable workforce. Some schools, like Webster University, offer online degrees in both fields. Others have combined the two. For example, New York University’s Online MS in HR Management and Development allows students to choose a concentration in their area of interest (i.e. HR management; organizational effectiveness; learning, development, and executive coaching; or global talent management). Is There A GRE Requirement? When it comes to online master’s programs in human resources, GRE requirements vary widely. Some schools want to see a minimum test score. Others don’t care. For example, applicants to Pennsylvania State University’s MPS in HR and Employment Relations must have at least two years of full-time work experience and a solid undergraduate GPA, but no GMAT or GRE scores are necessary. What About Internships or Real-World Projects? We love online graduate programs that expose students to real-world scenarios and complex workplace issues. Look for case studies, capstone projects, internships, and experiential coursework in the curriculum. For instance, in addition to a thesis or major project, students in Indiana State University’s Online MS in HR Development are also required to complete a professional internship. Can You Transfer Credits? When it comes to credit transfers, universities often accept academic credits for graduate coursework; they may even issue credits for work or life experience. For example, students applying to Thomas Edison State University’s Online MS in HR Management can transfer up to 12 credits and may be eligible for prior learning credit. The more credits you can transfer, the more money you’ll save. Be sure to investigate your options. Can You Make Use of Your HR Certification? Do you already have a qualification from SHRM or HRCI? If so, you may be able to transfer those credits into the degree! For instance, students enrolling in Wilmington University’s Online MS in Management with a concentration in HR Management will find that the school awards up to six graduate credits for an SPHR certification. Talk to the program coordinator about your current qualifications (and see our Certification section below for definitions). Do You Need One? Most HR managers, including HR specialists and compensation & benefit managers, hold a bachelor’s or a master’s degree (e.g. MS or MBA). Human resources is a practical, business-focused field, so unless you’re aiming for a career in fields such as university teaching, industrial-organizational psychology, or research, you may not need a doctorate. Can You Find One? They’re rare, but online doctoral programs from regionally accredited schools do exist. Two examples? Capella’s Online PhD in Business Management with an HR Management Specialization and Regent University’s Online PhD in Organizational Leadership – Human Resource Development. Be aware that Regent University’s program has a residency requirement. Should You Choose a PhD, EdD or DBA? An online doctorate in human resources can appear under a variety of titles, including Doctor of Philosophy (PhD); Doctor of Education (EdD) or Doctor of Business Administration (DBA). Broaadly speaking, PhD programs love to focus on research & strategy; EdD programs will be concerned with teaching & training; and DBA programs will be chock full of business & leadership projects. But, again, check the curriculum. Are You Looking for an Undergraduate Certificate? There are some options. If you’re currently working, you may want to pursue an online undergraduate certificate in order to ease your way into a full-fledged bachelor’s program. For instance, Colorado Christian University’s 12-credit Online HR Management Certificate is available as a stand-alone program, but you can also transfer those credits into a degree in HR Management, Accounting, Business Administration, Information Systems Management or even Organizational Management. How Many Graduate Courses Do You Wish to Take? Certificates in HR topics are very popular at the graduate level. You can choose short & sweet (e.g. New York University’s two-course Online Graduate Certificate in HR Management); medium-length & comprehensive (e.g. Columbia College’s 18-credit Online HR Management Certificate) or long & in-depth (e.g. St. Leo University’s 21-credit Online Graduate Certificate in HR Management). Can You Transfer Credits Into the Program? Don’t discount your previous efforts at graduate education. Even certificate programs are willing to accept academic credits—up to a point. For example, Eastern Michigan University allows students to transfer up to three graduate credits into its Online Graduate Certificate in HR Management. Will Your Online Certificate Credits Apply to a Degree? Keep all your options open! Although a degree may be out of your price range now, your certificate credits can always be stored for future use. Remember, too, that the school may have built their certificate program to allow for an easy transition into a master’s degree. For instance, students in SUNY Empire State College’s Online Graduate Certificate in HR Management can transfer all their credits to SUNY’s MBA program. Does it Prepare You for Professional Certification Exams? Lots of programs will prep you for HRCI and SHRM exams, but it’s always best to check with the program coordinator to see exactly how the worlds collide. For instance, coursework in Davenport University’s Online post-baccalaureate HR Management Certificate (24-25 credits) is deliberately designed to align with HRCI exams. Can You Enroll if You Live Out-Of-State? In most cases, the answer is yes. Universities have developed great reciprocity agreements that allow students from other states to enroll in their distance learning programs (e.g. SARA). Pennysylvania State, for example, is part of SARA, but it’s also individually approved to offer programs in the non-SARA states of California and Massachusetts. Having said that, you may want to take a quick look at the State Authorization page of your school’s website just to make sure there are no hiccups. Does the Program Fit With Your Schedule? Smart schools know that you’ll have multiple work and personal commitments to juggle. That means online HR programs are usually very flexible! There may be multiple start dates, shorter terms, and asynchronous classes (i.e. there’s no need to log in at a certain hour). For instance, at Colorado State University, online classes are offered in an accelerated eight-week format, and a new term starts each month. In addition, all online courses are offered every term. Do some digging to find out if classwork and group projects require your presence at a certain time of the day. What is the Credit Transfer Policy? Every university has its own unique (and sometimes baffling) credit transfer policy, so you’ll have to spend a little time with the website to sort out if your existing credits can be used. In addition to traditional academic credits (i.e. previous coursework), schools may be willing to accept other forms of education. UMUC, for instance, grants academic credit for military education and experience, workplace learning, and credit by exam. When in doubt, ask the program coordinator about your options. Who is Teaching Your Online Course? If you search the course schedule in the academic catalog, you’ll usually find the name of your professor listed under each class. Look ’em up on LinkedIn. Read reviews on their teaching. Discover whether they work in relevant business fields. Some universities, such as New York University, are refreshingly upfront about this info. Under the program website for Pennsylvania State University’s Online MPS in HR and Employment Relations, you’ll find lengthy profiles of the faculty, with details on both their education and work experience. Is the Coursework & Training Relevant? There’s nothing worse than investing big bucks in an online program with outdated subject matter and irrelevant training. For the money you’re paying, you deserve an education that will prepare you for professional HR certification, school you in specific HR subjects (e.g. employment law, labor & industrial relations, compensation & benefits, talent management, accounting, etc. ), train you to become a leader, and expose you to internships & real-world projects. Good schools are even willing to post their job placement rates. How Does the HR Program Support Online Students? Distance learning can be challenging, especially if you’re used to face-to-face instruction. The best online HR programs will go out of their way to provide free tutoring, tech support, career services, job placement, and help with arranging internships. Some schools also like to incorporate personal interactions into the coursework. For instance, in addition to real-time electronic classrooms, Nova Southeastern University has online student discussion forums and bulletin boards. Does it Follow SHRM Curriculum Guidebook and Templates? Many schools use SHRM’s HR Curriculum Guidebook and Templates to develop their bachelor’s and master’s degrees, so you’ll see it mentioned a lot on program websites. Fortunately, you can find all HR- and HR-related degree programs that align with these guidelines in SHRM’s handy HR Program Directory. Plenty of schools in the directory also appear in our online rankings above. Does it Cover the Categories in the HRCI Body of Knowledge? Another framework that universities might use to prepare their curricula is HRCI’s HR Body of Knowledge. For example, the Online BS in HR Management from Western Governors University is designed to cover all six categories in the HR Body of Knowledge (business management and strategy; workforce planning and employment; human resource development; compensation and benefits, employee and labor relations; and risk management). It’s another quality marker to consider while you’re pruning your shortlist. Are There Hidden Costs? Scour the tuition & fees page with a fine-tooth comb. Schools love to tack on fees for distance learning or technology. You may also be expected to pay for materials (e.g. textbooks), computer equipment, and travel to internship sites. Don’t trust the per credit cost—you’ll need to budget for every expense. Is Financial Aid Available to Online Students? If you choose an online bachelor’s or master’s program at a regionally accredited institution, you will usually qualify for financial aid packages (e.g. loans, grants, and scholarships offered by the government and/or the university). On the other hand, non-degree programs like graduate certificates are not typically eligible for financial aid. Be sure to visit the website of the Office of Financial Aid for all the details on online programs. You may find you qualify for external options (e.g. outside scholarships, employer reimbursement programs, etc.) and funds for adult learners. Do Online Students Receive a Tuition Discount? Public and state universities often offer tuition breaks to online undergraduates (and sometimes to graduates) who reside in the state or in neighboring states. Other universities give tuition discounts to online students regardless of their location. For instance, Colorado State University does not charge out-of-state tuition fees. Policies vary between schools, so visit the tuition & fees page for details. Have you found an HR program that’s not listed in our rankings? Before you sign on the dotted line, double-check its credentials. Find out where the university is located and then have a look at our Online State Rankings. Under each state, we have a detailed list of Online Schools with Accreditation & Quality Concerns. The following universities appear in our rankings of Top Affordable Schools for Human Resources and Top Online Schools for Human Resources. That means they have met some extremely tough criteria for quality, flexibility, price, and use of financial aid money (you’ll see a CAG Score next to their profiles). Geneva’s Online BPS in Human Resources is handled by the Adult Degree Programs division, which posts current tuition costs in its section on Adult Degree Tuition & Aid. Geneva offers discount tuition rates to employees of its corporate and organizational partners. More than 90% of Geneva’s adult students qualify for financial aid. The section on Adult Degree Tuition & Aid also includes details on military benefits (e.g. Yellow Ribbon Scholarship) and special grants for laid-off workers & transfer students. The James Naim Memorial Scholarship is open to students in the Adult Degree Programs; eligibility is based upon a scholarship essay and financial need. Whatever HR degree or certificate you decide to pursue, make sure it comes from a university or college that holds regional accreditation. This accreditation is given to a school, not an individual department or program, so it encompasses both on-campus and online offerings. There’s a reason we keep harping on about this. Earning an online qualification from a regionally accredited institution will make it easier for you to transfer credits; qualify for federal aid; apply for student loans, scholarships, and tuition reimbursement; and gain acceptance into graduate programs. Many regionally accredited schools will not accept credits from nationally accredited schools. AACSB is often regarded as the gold standard. We go into more detail about these organizations in our guide to Affordable MBA Programs. HR Certification Institute (HRCI): The 3 most popular HR certifications are Professional in Human Resources (PHR®) for early career professionals; Senior Professional in Human Resources (SPHR®) for experienced HR professionals; and Global Professional in Human Resources (GPHR®) for professionals managing HR in multiple countries. Society for Human Resource Management (SHRM): In addition to creating curriculum standards for HR programs, SHRM has developed two major certifications for HR professionals: the SHRM Certified Professional (SHRM-CP) and the Senior Certified Professional (SHRM-SCP). There is an ongoing debate about which qualifications are better. PHR and SPHR are well-known in the business and can lead to higher pay scales. But SHRM is coming on strong. We don’t have a firm opinion. Talk to your mentors, do some research, and look at HR job descriptions to see which certifications are listed in the job requirements. The good news? Many HR online programs will help prepare you for these certification exams. Universities should state this clearly on the program website. If they don’t, check with the program coordinator.